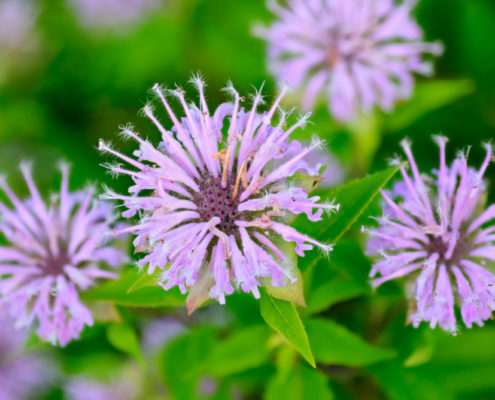 Bee balm repels deer with its minty scent, but pollinators can’t get enough. Bee Balm blooms in violet blue, red, pink or white from July through August and grows relatively tall, 2-3 feet. Boost your Bee Balm with Espoma’s Organic Flower-tone fertilizer for big, healthy flowers. Best suited for zones 4-8. Did you know that honeybees are directly responsible for pollinating one third of the food we eat? Pollinators, such as bees and butterflies, play a big part in getting our gardens to grow. They help fertilize flowers, carrying pollen from one plant to another. In return, pollinators only ask for food — the nectar and pollen from flowers they visit. 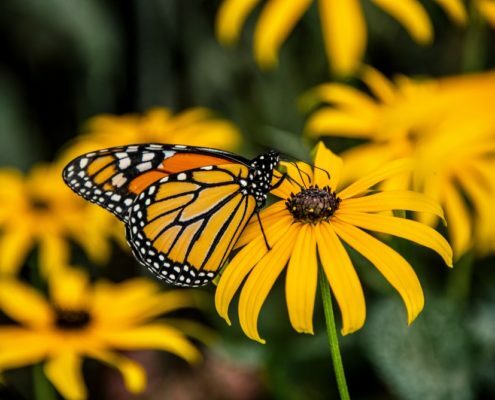 Lately, pollinator populations are declining. Thankfully, you can still “bee” an ally for pollinators by creating habitats for them in your own garden. A garden frequented by pollinators is both healthy and beautiful. Give pollinators what they need and you’ll watch your whole garden bloom livelier than ever. Location. The best way to attract pollinators is to plant flowers that appeal to them. Either add to an existing garden or designate one specifically for pollinators. Choose a sunny location and remove weeds from the plant beds. Layer. Entice pollinators with native flowering plants that bloom at different times throughout the year, provide food and habitat. Include several types of flowers that produce nectar and sticky pollen. 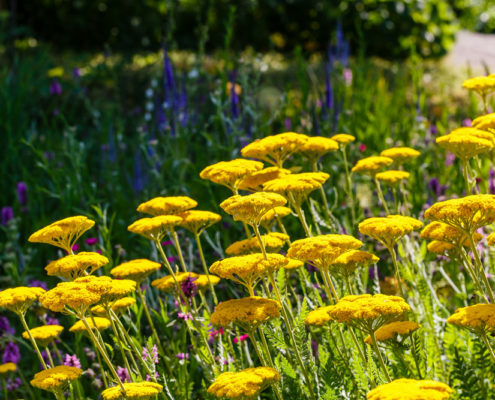 At the back of your garden, plant tall flowers such as coneflowers, sunflowers, black-eyed Susans and asters. Their petals provide landing platforms for pollinators. In front of the tall flowers, plant medium flowers, like catmint and yarrow. 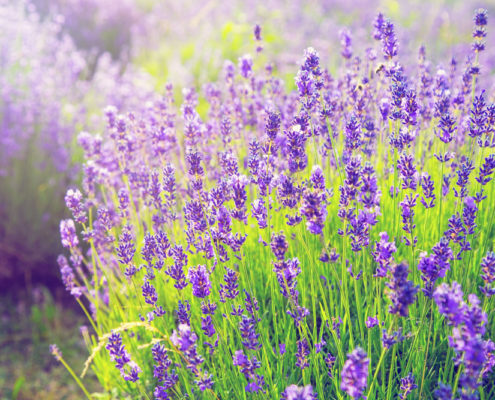 In front of those, plant shorter flowers such as verbena, or herbs that flower, like oregano. Planting. Plant tall flowers 18-20” apart, medium flowers 12” apart and short flowers 8-10” apart. Sprinkle flowers with Plant-tone, an organic plant food that won’t harm any visitors to your garden. Or, try our new Grow! organic liquid plant food to quick-start your plants’ growth. Now that your garden is set up to welcome pollinators, wait for the flowers to bloom! Share pictures of your pollinator habitat with us on our Facebook page! Fabulous and fun, containers filled with bright blooms are easy to maintain and thrive with the right care. They’re great additions to any patio, yards or landscape. Before summer’s heat and dry conditions get the best of them, give them what they need. Keep containers in tip top shape with these easy tips. Here’s how to extend the life of containers for a summer of color. Deadhead. Use pruners or shears to snip off dead or dying flowers, stems and foliage. This is called deadheading. Don’t be afraid to clip stems back a little to encourage new growth. This not only makes the plant look better, it helps encourage more blooms. Want even less work? You can always opt for plants that do the deadheading on their own, like Million Bells. Feed. Feed established containers with Bloom! liquid fertilizer to promote & prolong flowering. Simply flip, fill and feed. Or, sprinkle granular Plant-tone on the soil surface and gently work in. Water. Containers need to be drenched – generally every day – and make sure to get the roots. Water until it pours from the drainage holes. Be sure to empty saucers to keep roots from getting waterlogged. Replace. If all else fails, simply replace the leggy or tired plants in your container garden with late-season bloomers, like ornamental cabbage, coneflowers or sedum. Now that your containers are taken care of, sit back and enjoy the heat of summer! Step aside houseplants. Not now indoor herbs. There’s a new indoor winter gardening project in town… indoor seed starting! One of the biggest mistakes when starting seeds indoors is starting too soon. Before starting seeds inside, look up the last spring frost date in your area, then count back 4-6 weeks. That’s the best time to start seeds indoors. This handy seed starting chart from Organic Life makes it easy to calculate when to start and transplant your seeds. Not all seeds succeed indoors! Save root crops and cold-hardy seeds for when it’s warm enough to plant directly outside. Or, you can grow two crops of broccoli and lettuce. Start seeds indoors now then sow more outside later. Here are the best vegetable and herb seeds to start indoors in winter. There are three secrets to starting seeds indoors: warmth, light and an organic seed starting mix that promotes root growth. Fill seed trays to within ¼” of the top and lightly water. Follow the instructions on the seed packets to see how deep and far apart to plant. Cover with soil, press down and label. Place tray in a larger pan of shallow water for a minute so thewater seeps up from the bottom. Place seeds in a warm spot between 65-75°. Try the top of the fridge! Loosely cover tray with plastic wrap or the cover from your seed-starting kit. Check seeds daily for moisture. Find even more detailed instructions here. Give seeds 12-16 hours of light daily. Supplement sunlight with grow lights if needed. Once you see sprouts, remove the cover and move seeds to a sunny, south-facing window that is 65-75°F. Then, turn the container a little each day to prevent leaning seeds. When leaves grow, add a bit of fertilizer such as Espoma’s Plant-tone or liquid Grow!. Both are organic fertilizers, so they are safe to use on edibles, around children and pets and they help plants grow bigger than ever before. Once you see that first sprout peeking through the potting soil, homegrown veggies are only weeks away! With just a tiny bit of water, a handful of seeds and some sunshine, your garden makes its own magic. Well, almost! Your plants get all their food from the soil, too. After a busy summer, it’s time for your soil’s checkup, so your soil can keep growing its best. Perform a soil test to see what your soil needs. And, we’ll help you understand what those numbers mean! Scoop, Snoop and Score Soil. Your soil’s health is a mystery waiting to be solved. All you need to do is grab a handful of soil and examine it. Send it off to your local extension service. Or, get down and dirty, and DIY it. Here’s how to perform a soil test. Soil tests measure the nutrients available to plants along with their pH level. Garden soil should be between 6.0-7.0 pH, while the ideal pH for grass is 6.5-7.0. Low pH? Power the Sour. You’ve got sour, also called acidic, soil with a pH level under 7. Before remedying, remember some plants like this! Raise soil pH levels by adding Espoma’s Organic Garden Lime. High pH? Treat the Sweet. Soil with a pH level over 7 is known as sweet, or alkaline, soil. To fix, add Espoma Organic Soil Acidifier. Looking at your soil test, your head may start spinning. What do all those numbers mean? Stick with us, your teacher at Espoma’s Garden School, to learn! When to N. The “N” on your soil test stands for nitrogen, which helps leaf growth. To raise nitrogen levels, add an organic fertilizer with a higher nitrogen level. Or, use blood meal or fish meal. To lower nitrogen levels, choose a fertilizer with less nitrogen. Be the P. “P” represents phosphorus, which helps plants flower and grow fruit. Need more phosphorous? Use an organic fertilizer with a higher percentage of P. Or, add bone meal. To lower phosphorous numbers, cut back on the P on the fertilizer bag. Way of the K. “K” stands for potassium, which helps plants resist diseases and grow healthy roots. If you have too much K, use an organic fertilizer with less potassium. Likewise, if you need more, opt for an organic fertilizer with a higher number K. Or, add sulfate of potash or greensand. Strong, healthy soil gives way to stronger, bigger and better plants. Talk about a productive day in the garden! Today’s garden is bursting full of fresh fruits and veggies! There is nothing better than picking and eating a tomato, bean or pepper fresh off the plant. Yet – we aren’t always so lucky. With fall around the corner, we are already thinking about how to prolong that never-ending supply of delicious, homegrown produce. Now is the time to start cool-season seeds indoors. Get the Goodies. For fall crops, pick the hardiest and most frost tolerant seeds, so they can survive the first frost. Some of our favorites include broccoli, cabbage, kale, cauliflower, beets, carrots and spinach. Time to Prime. Find your first fall frost date. Look at the number of days to harvest on each seed packet. Use that number to count back from the first frost date, so the seeds have time to mature. Play it safe and add two weeks since plants can grow slower during short fall days. Awaken the Seeds. Fill seed starting trays within ¼” of the top with a high-quality organic seed starter, like Espoma’s Organic Seed Starter. Read each seed packet to learn how deep and far apart to plant seeds. Cover with soil, press down, label and lightly water. Store and Cover. Lightly cover the tray with plastic wrap. Keep in a sunny spot near a south-facing window. Smart Watering. Keep seeds moist by placing the tray in a pan of shallow water until the water seeps up from the bottom. Refill when empty. Break Out Sprouts. When leaves start to poke from the soil, remove plastic wrap. Feed with an organic fertilizer, like Espoma’s Plant-tone. A Home Away from Home. Two weeks before planting outside, begin hardening off seeds. Move outside for a few hours a day, increasing time outdoors daily. Also, reduce watering without letting the soil dry out. All Grown Up! Gently remove plants from see starting tray, and plant in a prepared bed. Mix-in organic starter plant food to help them adjust and grow strong, such as Espoma’s Bio-tone Starter Plus. Crunch! You’ll be munching on homegrown produce well into fall. How amazing (and tasty!) is that?